Videographer Jonathan Eau Claire documented two very important events which took place in late 2013. In September the not-for-profit Western Maryland Scenic Railroad celebrated its 25th anniversary. In addition to its regular locomotive, Western Maryland #734, visiting tank engines Flagg Coal #75 and Viscose Company #6 arrived to pull special trains during the celebration. To accommodate the huge crowds, the railroad operated an impressive number of trains between Cumberland and Frostburg, Maryland, plus shorter trips to the Cumberland Narrows, the railroad’s shops, and rare mileage trips into West Virginia. A month later, a unique two-day photo charter by Lerro Productions transformed former Lake Superior & Ishpeming #734 into Western Maryland #729. The 2-8-0 performed a variety of tasks for our cameras, including spectacular helper service on the railroad’s steep grades with an all freight consist. The weather conditions during the charter couldn’t have been better, giving us stunning video from dawn to darkness. Antique vehicles and costumed extras rounded out our time travel to another era. Western Maryland Scenic Railroad carries passengers on 16 miles of former Western Maryland tracks, passing through a water gap between two mountains, Brush Tunnel, and the iconic Helmstetter’s Curve along the way. The heritage railway regularly operates two GP30 diesels and 2-8-0 steam locomotive #734, all in Western Maryland livery. Our footage was captured with multiple tripod-mounted HD cameras. Running time is approximately 84 minutes. The DVD is conveniently organized by chapters, with minimal narration. Approximately 84 minutes. The footage was captured with multiple tripod-mounted HD cameras. The DVD Is conveniently organized by chapters. Minimal narration - less talk, more action! 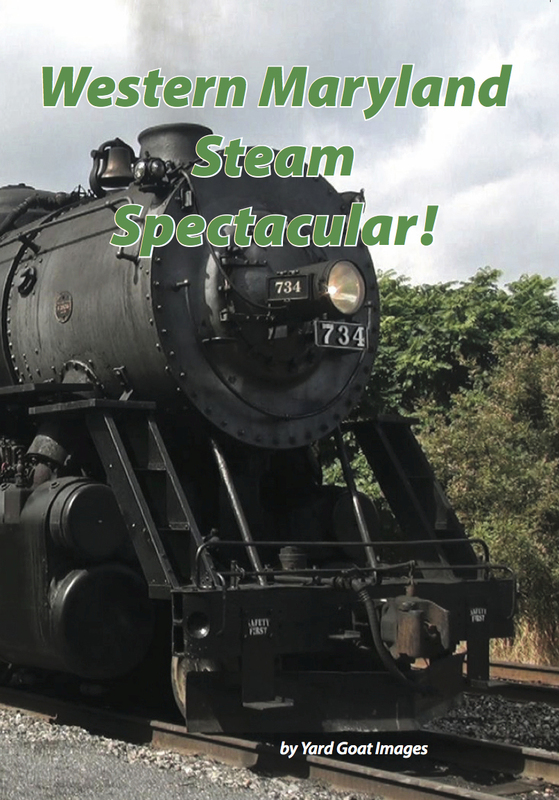 Preview - Western Maryland Steam Spectacular DVD from Yard Goat Images on Vimeo.